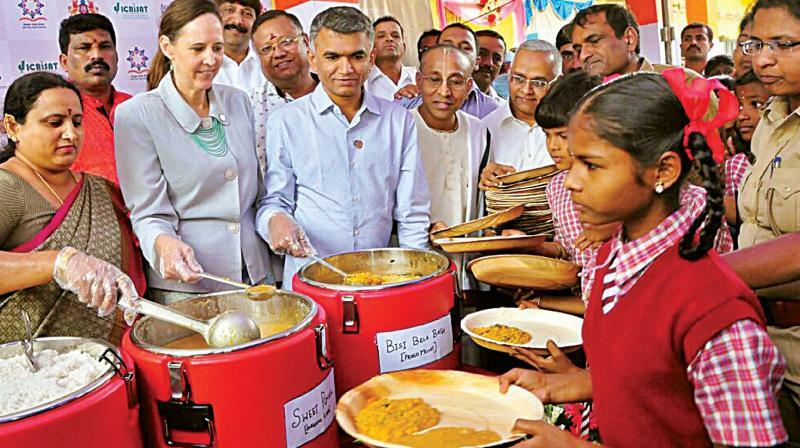 Bengaluru: The Akshaya Patra Foundation on Friday launched a pilot programme in partnership with the state government to introduce millets in the mid-day meal scheme. The event was held at a government higher primary school in Kumaraswamy Layout. The Agriculture and Education Departments too will be partners in the programme. The project will cover 1,622 children across 10 government and government-aided schools in Bengaluru and later will extend to all the 4,86,172 beneficiaries served by Akshaya Patra in the state. Other organizations which will contribute to this initiative are the Central Food Technological Research Institute (CFTRI), M.S. Swaminathan Foundation (MSSRF), National Institute of Nutrition (NIN), Indian Institute of Millets Research (IIMR), and other government and industry groups. The state government is organizing “The Organics and Millets 2018”, an international trade fair from January 19 to 21 at Bengaluru Palace. The trade fair is meant to create awareness among the public about the benefits of organic and millets foods. Also, millet beer is becoming popular and it comes in a variety of combinations with ragi, jaggery, and barley and other varieties of millets are used in a combination with fruits, spices, and vegetables. A millets beer festival, in association with the International Trade Fair in Organics and Millets, will also be held simultaneously. Pubs in the city will serve millet beers from Jan 19 for two weeks.